If you are serious about learning Spanish, this will help you. However, it moves too fast to be your ONLY method of learning. You also need a beginning book or beginning class. This helps you listen for understanding and pronunciation. It starts with words and short phrases and moves quickly to longer sentences. Each lesson builds on the ones before, with concepts adding quickly. You hear it first in English, then there is a pause and you try to say it in Spanish. Then you hear it twice in Spanish, with a pause each time for you to attempt it. You learn much faster if you do try to pronounce it, as they recommend. Cut it off in heavy traffic, it requires concentration! I've been using it for a year, and have completed 2 of the 3 levels. My comprehension and pronunciation have improved tremendously as a result! This series is formatted differently from other beginning language courses, such as those from Living Language and Berlitz. It's not a series of phrases designed for the traveler, but a more complete course for people who have aspirations of fluency. Hence, I'd recommend this course to anyone who was serious about learning the Spanish language, but not to the occasional traveler. Plan on spending several months going over the material. The early part of the course involves a considerable amount of basic vocabulary. Sentences and phrases come later. Once they do, they build upon each other quickly, so you'll be glad you learned the vocabulary. The advantage of this approach is that when the sentences come, you have a better chance of understanding and remembering them. The downside is that you really have to force yourself thru the early part of the course without any sense that you're getting anywhere. The material is perfectly suited to anyone with a long commute. What's needed is about 45 minutes per day of uninterrupted listening -- over and over and over and over. You don't even need to listen that hard. It's more like singing along with the radio. Just the constant repetition, with you repeating the words and phrases, is enough to implant the material in your brain. After a while, you'll know the language and not know how you know it. One great advantage of the presentation over other similar courses is that there is a slight pause between the English speaker and the Spanish translation. This pause allows you to say the Spanish word or phrase before the Spanish speaker, if you know it. This seemingly insignificant detail is actually critical for learning. Other courses put the Spanish translation immediately after the English speaker, without a pause, and you never really build the kind of recall that you need. Another advantage of the course is that it presents both Spanish and Latin American versions of words and phrases, when there is a difference. The more you practice, the better it gets! I started learning Spanish about 8 1/2 weeks ago using another set of CDs and a book as well as this set, but I have gradually switched over to using this set of CDs alone and am currently working on the 8th of the 9 CDs. 1) It is great for developing your accent. Constant repetition developes the right muscles in your mouth, tongue and lips for speaking Spanish. At first I really struggled with certain sounds, but by striving to mimic the speaker, I have really come a long way. Pronouncing words and phrases correctly and fluently is incredibly important if you want to speak decent Spanish, and this is one of the biggest strengths of this course. You start off just trying to get each word right, then getting whole phrases and sentences exactly as spoken, with all the accents in the right place, 'r's trilled, and vowels elided as required. 2) Constant repetition of the pattern sentences helps to reprogram your brain in Spanish without any real effort on your part. Sometimes I will drive for long distances repeating every phrase 3 times while my brain is elsewhere, but find that later in the day those same phrases are running through my brain and that I am wanting to speak to English speakers in Spanish, which shows that the program is definitely doing its job. 3) I find myself making up original Spanish sentences in my head, based on the pattern sentences. All these changes have occurred in the last few weeks, without any effort on my part and without me devoting any special time to the projects, except time when driving, walking, or lying in bed with a Walkman type CD player. Now I am over the worst bumps in starting to learn Spanish. I know the 30 most common verbs, even if not fluent in all their tenses, I know the 20 or 30 most common prepositions, how to use reflexive verbs, the numbers, the days of the week, the months, the seasons of the year, the weather, lots of nouns and adjectives, the use of many idioms with the verb 'tenir', the mysteries of the verb 'haber' , several ways to say 'excuse me', and, most important of all, how to ask someone to speak more slowly, or "mas despacio", as we Hispanophones like to say. The materials are extremely well organized, though you do not need to know this, and new concepts and vocabulary are introduced in a logical order a teaspoonful at a time, so that you never feel you are learning vocabulary or grammar, yet you are speaking Spanish, so you must be digesting something. I am not sure that there is any correct or incorrect way to use these discs, but my method is to play each disc 10-12 times, first just listening a few times and repeating in my head, but not aloud, then listening and repeating, and finally giving the translation in Spanish before hearing the Spanish version. When I am heartily sick of a disc, whether or not I know everything on it, I move on to the next disc. When I have completed all, I will go back, revise, and reinforce my knowledge of all the materials--at least that is the plan. I really recommend this course. You have to put in the work of repeating phrases, but that is about it. After that you can just open your mouth and let the Spanish flow. Obviously the course will not give you every word or phrase you need, but you can use an online translator to make up the sentences you really feel you want and you will have enough knowledge by now to know if the translation program has got it right, and to be able to edit any errors or misunderstandings. Soon after writing the above, after about 9 weeks with the CDs, I made my first trip to a Spanish speaking country with wonderful results. Mostly I avoided being around English speaking people and initially I was pretty tongue tied, but by the end of three days I was starting conversations with strangers, ordering meals without reference to the menu, and had learned almost enough Spanish to get a job as a soap opera writer in Spanish. By the time I left I did not want to stop speaking Spanish and in fact continued on the plane and in the airport in Miami. I was even thinking and dreaming in Spanish, for goodness sake. Since my return I have had conversations with Spanish speaking people I have met, and it is amazing how friendly they become when you are trying to speak their language, however badly. Don't get the impression that I am now miraculously fluent in Spanish. My Spanish is still pathetically bad, but I am still working with the CDs as I drive and improving all the time. Maybe there are other better courses for learning Spanish, but all I can say is that this one has hit the spot for me. This is very poorly put together. Much too much chit chatting (in English). No real lessons. Have to listen to too much chatter and the sound has very poor quality...like he was talking into a tape recorder. At last a Spanish CD course which requires no reading and which teaches you to actually speak Spanish in a minimum of time and effort. The course also comes complete with a complete 207 page illustrated text with tapescript, same page answer keys and English translations for home review. 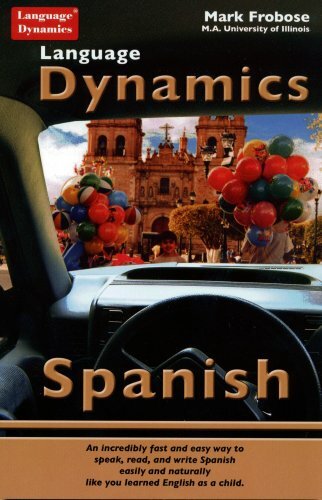 Designed by the experts at Language Dynamics, 'Behind The Wheel Spanish For Your Car' takes the learner form basic to intermediate level Spanish without the guesswork and pain usually associated with language learning. An expert English speaking instructor talks you through these tapes in English while a trained professional native Latin American Spanish speaker teaches you Spanish the way it is really spoken. Good... but Behind the Wheel? This is a pretty good course. I've learned some Spanish and I am just on CD 2. But, the book does not match the cd's very well. Some of the words taught on the tape are not the same words (are they synonyms?) in the book. 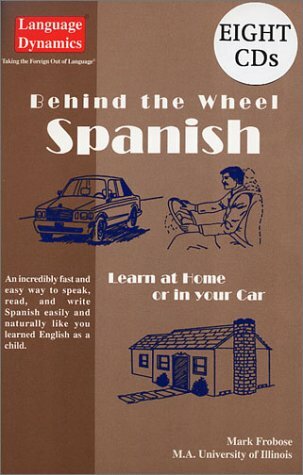 I think it was originally just a book and tapes, not meant really for learning behind the wheel and they just copied the tapes to CD (see Conversational Spanish in Nothing Flat). If they had taken just a little time and divided each tape into about twenty 3 minute tracks so that the driver could review more easily, it would be so much better. This is an amazingly helpful car Spanish course. I've learned a ton of Spanish already and I am only on CD 2. Fortunately, the book matches the cd's perfectly for home review and there is even a word for word tapescript and and answer keys (and English translations - what a Godsend) on the same page as the exercises.. I received the multi-track version of this set but I feel that with the built in review that the single track version would work just fine in the car as well. I rarely if ever use the multi-tracks because the course is designed to be 'real time' which means you don't have to artificially speed it up or slow it down. Just keep playing the CDs and you'll learn to speak Spanish. My set has 6 tracks per CD and they are beautifully produced. I am and continue to be a big fan of Language Dynamics, their method and above all, the Behind the Wheel Series. Multiple Tracks and is completely edited with no reference to tapes whatsoever. The former course was good but this one is great since I can now sail from lesson to lesson with my track changer and still enjoy the award winning voices and accents that have made this course an all time favorite. 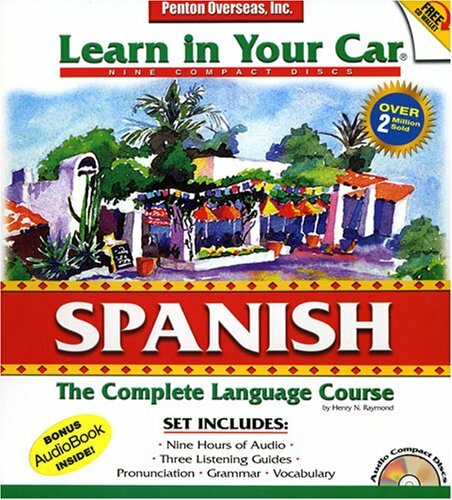 I bought Behind the Wheel Spanish upon the recommendation of a friend who had heard an interview with Mark (the founder of Language Dynamics) while on business in California on a radio program called LA Insight with Skip Kelly. She was so impressed that she bought the course right away and learned to speak Spanish right away as well. About a month ago I saw Mark's interview here in New York on Fox 5's 'Good Day New York' where I was instantly impressed by his method to teaching foreign languages in a simple and fast way. Seeing and hearing this and having her glowing recommdation before me daily compelled me to buy the course as well. The course performed for me just like it did for her (of course, I had to PRACTICE) but it was well worth because now I can speak Spanish. 1. The product has superb clarity of voices and exudes a spontaneity which makes learning Spanish fun. Thanks to this, you feel an affinity for the course and actually enjoy it. 2. The fast and easy to learn design of the course, beginning with the immediate gratification you feel when you conclude your first one half hour session with the CDs speaking sentences in Spanish that Spanish speakers understand 10 minutes later on the street. 3. The 'natural' way you just seem to pick up Spanish without having to learn grammar or reviewing. No need to go back. It's all 'built in' the course. Just keep playing it over and over, wherever you are. good that every Spanish speaker you bring to listen to your CDs says that 'This guy's Spanish is excellent' . 5. The thrill of being able to express what you really feel in 100 different ways because you know own a linguistic blueprint, a template that you can manipulate over and over again in different and personal ways while increasing your fluency. 6. The satisfaction that comes from knowing that instead of wasting your time doing nothing in your car, while jogging, shopping, walking, etc ... that you are becoming fluent in Spanish. And this is confirmed by native Spanish speakers with whom you interact daily with whom you share what you have learned from your course. 7. Getting the past, present and future along with idioms all in the same course. 8. Having a complete illustrated text with answer keys on the same page for home or office review. 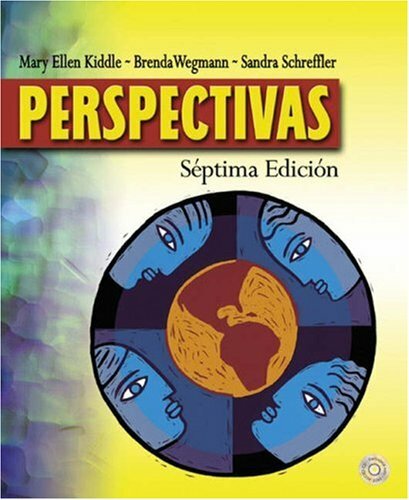 I had a very bad experience with this textbook in my Spanish class at school. While it is very easy to do well on the accompanying tests, it is also easy to escape without learning very much Spanish at all. The main drawback is that the book uses much of its vocabulary without ever having officially introduced it. Then, when you go look words up in the back to find out what they mean, they aren't there! Further, although topics are introduced in logical order, they are not organized in the chapters in a standard format. This makes it difficult to locate a previous concept if you wish to review it. At last!Atruly complete 8 CD with book, tapescript, same page translations, answer keys and CD translations that includes Language Dynamics famous language learning system. Developed by the experts at Language Dynamics Inc. to teach you a maximum of Spanish in a minimum of time, Conversational Spanish in Nothing Flat is unquestionably the fastest and easiest Spanish book/CD course on the market. From Berlitz to Pimsleur, I would say that all Spanish courses have good and bad points. What makes Conversational Spanish in Nothing Flat so good is that it gets you speaking the language right away and then builds on those basic concepts throughout the course. The structure of this course, beginning with how easily a novice learner can begin saying his or her own sentences in Spanish almost immediately, gives even the shyest person confidence to speak Spanish. Most courses, despite their good points, shoot you right down in the beginning. You just don't feel like you will ever make it! Language Dynamics overcomes this feeling of 'overwhelm' by giving you simple yet useful basic bits of language to improve upon daily. First you crawl, fall down and then walk. Most foreign language courses expect the baby learner to run a marathon without the opportunity of learning to walk first. Conversational Spanish takes the time and effort to take you from the crawling stage, to the tottering stage, picks you up when you fall down, teaches to speak real Spanish little by little and then you just take off. No course does what this one does and for these reasons I highly recommend you try it. I have been delighted with both the results I have received and the quality of my Conversational Spanish course. The clarity and diction of the speakers on the CDs is wonderful. With this approach to language learning, you don't even have to rewind or switch tracks. The review is already 'built in'. It's perfect for the car because you just pop in the CD and the rest is automatic. If you miss something, rest assured, it will be reviewed at a later time. This method is far more advanced and streamlined than any I have experienced. It cuts through all the baloney and really gets you speaking conversational Spanish fast! GREAT COURSE FOR THE CAR! I live near a big metropolitan area and I do lot of driving (and sometimes trains) every day. I bought Conversational Spanish 8 CDs with the expectation of learning some Spanish during my two hour daily commute. I couldn't have underestimated this course more. I learned A LOT of Spanish during my commutes and what I have learned I owe to this great course. The thing that makes it so effective for me is that all the Spanish comes with English definitions so I don't have to stop the CD to go look up meanings. Add to this the fact that Luis (the native speaker) always repeats enough so that if you space out for a second, get honked at, or whatever, you still catch the lesson. My impressions of this course are that it is simple, easy to understand, and effective at getting you 'conversational' in Spanish fast. I find it nearly unbelievable that I am able to speak as much basic Spanish as I now do in such a short period of time. By the way .... The book is great too. (When you're not driving of course). Excellent Course. It's a Bargain! Conversational Spanish in Nothing Flat. My version is multi-track and I love the method which is very user-friendly and unintimidating. In short, it's easy. I became 'conversational' in Spanish within about 2 weeks of using this course daily for about an hour and a half a day. This means that I can now communicate basic likes and dislikes, express basic intentions and needs effectively using basic practical survival Spanish, ask basic questions and give basic answers, all while using my own original sentences. I have also learned quite a bit about how the language is written from the text which is included. Great Course!! Great Quality!! Great Value!! One week with Language Dynamics' Conversational Spanish in Nothing Flat has gotten me results that totally eclipse my earlier experiences with other Spanish courses. It's easy to understand why Language Dynamics courses have consistently been rated as among the best and highest quality foreign language courses on the market today. Groups such as Men's Health Magazine rated Language Dynamics courses as among the best alongside Pimsleur and Rosetta Stone and received the additional distinction of being a 'Great Value'. (something many of the competition don't offer). Communicate instantly on a host of topics: health and medical situations, essential services, boat, plane and train travel, much more. Well, it is still a good book, but I could see a few improvements that could make things better. The book lists phrases, yes, phrases...nothing more. For example, after you say, what time do you open, in Spanish, you will have to search next thing to say digging entire book. Again, it only lists simple phrases by the category. If you need some Spanish in a Hurry! Everyone has to start somewhere, and this book is a good place for beginning students of the Spanish language to start. This slender volume provides a lot of expressions that you can readily use as you begin to interact with Spanish-speakers. In the initial stages of language study, it is often difficult to extract the functional sentences you need out of a textbook or more extensive course. This book is just the remedy you need for that problem. It is also a bargain for the price! You can't beat this book - for the price and the small, yet concise and relevant content. Learn how to tell time, order food, go through customs, as well as greetings and social conversations just to name a few. Especially helpful are the pronunciation guides listed below each phrase. Muy bueno for the traveler or beginner. Cheap,quick,easy to use spanish guide. 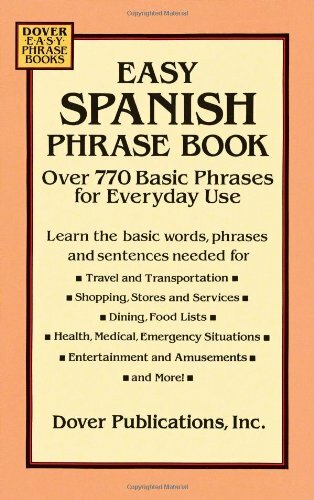 About 70 pages long and for [dollar amount] you cannot beat this book.All the basic spanish for travel shopping dining emergency and amusement.Along with the spanish word is also a phonetic pronunciation guide,which is also a big help. Worst book I have ever used to learn a language. Who ever wrote the book was into a lot more than teaching. You need to use this disc or that disc or use the internet. The Prenhall is not very user friendly either. The book is very confusing. This is everything I could have hoped for in a foreign language textbook; it is an instructor's dream. Now...if they only designed a text of equal quality for Portuguese! 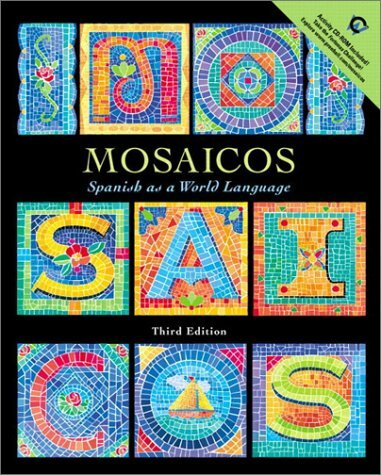 Mosaicos is a complete and well-written language program. The material in the textbook is presented logically and in a practical manner. Additionally, the workbook, audiocassettes, and lab manual reinforce the textbook lessons while improving interpretation skills. The benefits of having various, native Spanish speakers on the lab cassettes are immeasurable. I found this package set to be not only effective but also enjoyable. Whether a student or traveler, "501 Spanish Verbs" will make it easier for you to conjugate the many verbs associated with this Romance language. Just like many Romance languages, there are many tenses to memorize, however with the alphabetical, easy-to-use style author Christopher Kendris has used, conjugating Spanish verbs is as easy as 1-2-3. Similar to "501 Portuguese Verbs," the book also contains short phrases commonly used in Spanish-speaking countries such as Spain and Mexico. The reader needs to be aware of the differences between Castilian Spanish and Latin American Spanish. Latin American usage eliminates the "vosotros" tense, and dialects among the many Spanish-speaking nations can often have words that mean one thing in one country, and something else in another. Keep an eye out for regional dialects (e.g., Castilian, Mexican, Antillean/Caribbean, Central American, etc..). Overall, a must have for those wanting to brush up on their language skills. It's a great reference book to have in your collection. 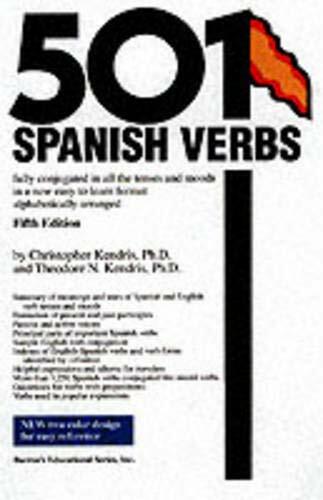 There are other Spanish verb books out there that claim to be better, or have more verbs written out in their full conjugations, or give you better insight to their usage in different countries, etc., but Christopher Kendris's book is the fastest to look up verbs, and the easiest to use. There are no fancy boxes with a lot of small print inside, or so many explanations that you can't find the verb. This is a no-frill, look-em-up, you-got-it kind of reference. It is extensive enough to satisfy most students (and even some native speaking professors!) Yet it does not go so deep that you have to finish the novel before you get the conjugation that you only have 10 seconds to look up for your work. Contrary to the opinion that the work is only good for people who need to see a few hundred AR verbs fully conjugated, most students learn faster and retain the knowledge better when they hear, SEE, and write the information they are learning. It IS important to see the verbs conjugated because then they are reatined better in your memory. What would you remember better, a description of a beach in Hawaii, or a picture of it? This book is not just for slow students, it's for every learner or reviewer. If you have outgrown the need for this book, don't buy it, or get one that goes more deeply into the subject. But let's not confuse our own needs with the value of this book. By the way, this one can still fit into your purse or briefcase. Without a doubt, 501 Spanish Verbs is the most useful book available to a student of the Spanish language. It is not just for students, however. I have heard that even fluent professors have had to consult this book at one time or another because they were confused about how a word was conjugated. Verbs are the backbone of the Spanish language, and if you don't know how to conjugate them, people won't understand you. I take this book with me whenever I go on vacation to Spanish speaking countries, and it has proved infinitely useful during conversations where I didn't know how to say a verb. 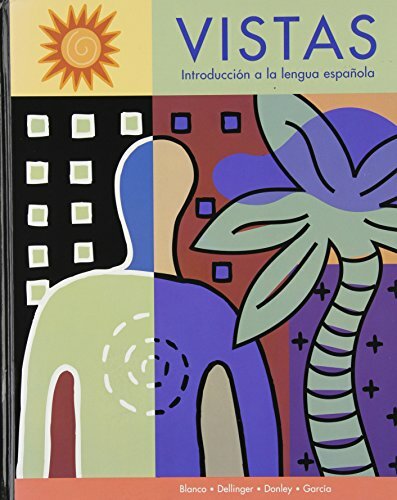 Spanish speakers are incredibly patient if you don't understand them and need to look something up, and this book is definitely the most helpful. I should also add one thing: This book unfortunately does not distinguish between verbs commonly used in Spain, and other verbs used in Latin America that mean the same thing. An example is abrasar (to burn or light) and abrazar (to hug). I was telling a Colombian security guard that I was lighting fireworks, and he was confused. Turns out I was saying that I was hugging fireworks. Abrasar is only used in Spain. In Latin America the word for lighting or burning something is Encender. I hope this book helps you as much as it did for me. Every Spanish language student needs to have this book in their reference collection. It's an extremely accessible guide to verb conjugation and a great vocabulary builder. Great for all levels and ages of langauge learner. I can even think of some native speakers who could use it. The quickest and easiest way (that I know of) to learn a language. Its all audio so you don't have to stare at a book. Just hit play, listen and repeat and you're learning spanish. I just finished the 30 lesson course yesterday and I am looking forward to getting the second set. I recommend this course only to those who are serious about learning spanish. If you don't really want to learn spanish then don't buy this course. Get one of those tourist phrase books/tapes instead. Many benefits can be derived from learning Spanish as a 2nd language, not the least of which being able to communicate with those in America who either refuse to or are unable to learn English. Having had no formal Spanish training since 8th grade, I took it upon myself to learn Spanish on my own. Learning a 2nd language may prove too daunting a task for most, but if you have the initiative and intelligence, it makes for quite a rudimentary task - with the help of Paul Pimsleur, of course. For your own edification, Spanish can be learned, albeit not without effort, without formal training - much of which is useless anyway. 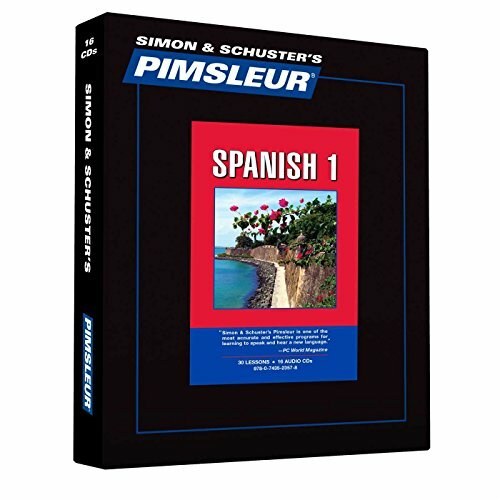 Pimsleur teaches the essential Spanish needed for traveling, working, dining, and awkward social situations. The CDs make for an easy learn for anyone with half of a brain. That being said, since one is not provided with a book for the lessons, it is incumbent upon the listener to look up and study any vocabulary and/or verbs that you may find confusing. I would give it 5 stars if only it were accompanied by a more thorough book that coincided with its lessons. Nonetheless, I still feel that this is the best audio reference available for learning beginning Spanish. The accent heard in the lessons is actually what we in Mexico call "Miami Spanish", a variety of Spanish that isn't native to any particular country but rather the result of a blend of accents taken to the US by all the Latin American immigrants (with an emphasis on Caribbean and Central American accents). I think it would be useful in Mexico and perhaps in Argentina, but certainly not in Spain, where vocabulary, pronunciation and speed make the language almost a different one. Too Expensive, Too Little Content and No Written Material! The learning technique is decent but lacks vocabulary for buying food or shopping, as well as numbers so I can pay for my food! No written material is provided for review or visual reinforcement. While it's nice to learn only from the CDs, a back-up written manual would help immensely since once does see written Spanish everywhere, in the US as well as abroad. There is a lack of versatility in the teaching structure which doesn't allow one to form basic Spanish sentences in a rapid and simple way. Last and not least, the price for this course is outrageous! Over two hundred and thirty dollars. My opinion is that there are many good language courses on the market for one third this price that will get you similar if not better results. This is the best language program I have found. I run on treadmill daily and have been trying all sorts of language program during my workout. Without naming Pimsleur's competitors by names, I found Pimsleur's instruction perfect for language challenged people like me. Prior to Spanish I, I completed Pimsleur's Brasilian Portugues I and II (in cassette tapes) and have no problem roaming around Brasil with my Pimsleur's Portugues (constantly got complimented by Brsailian of my "good" Portugese). I've just completed this Spanish I program. Pimsleur's standard of excellence continues and I enjoyed the program thoroughly and learned a lot. 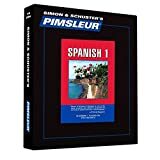 I humbly disagree with some reviewers who stated that Pimsleur's Spanish program only offers "general" Spanish and not culture specific. I actually consider this as Pimsleur's strength. Firstly, I am planning trips to Argentina and Colombia. Never had interest to visit Mexico. If this program is Mexican specific, it will certainly be a big turn off for me. Secondly, if my experience with Pimsleur's Brasilian Portuguese is any good reference, even Brasilian Portugese has its regional differences, so the opportunity is tremendous that one can pick up more culture specific expressions when visiting the country. Thirdly, I did try the "Encantada" with my Mexican friends. Instead of laughing at me, they are extremely appreciated and impressed that I take the effort to learn their language, albeit a bit gringo stype. So, Castellano de Gringo actually wins points. Anyone can learn a language with Michel Thomas--The World's Greatest Language Teacher. No books. No writing. No drills. And nothing to memorize--ever! With his unique program, Michel Thomas has taught celebrities, corporate leaders, and schoolchildren--with immediate and amazing results. Now the Language Teacher to the Stars invites everyone to join his class! Using Spanish with Michel Thomas, listeners learn in real time--fully understanding as they go along, turning words into short sentences, and then building them into longer, more complex sentences, until they are conversing in Spanish. Michel will have listeners formulating their own thoughts and sentences from the very beginning, even if they have never succeeded in learning a language before. Michel has used this very method to teach celebrities such as Mel Gibson, Woody Allen, Barbra Streisand, Warren Beatty, and Princess Grace of Monaco. 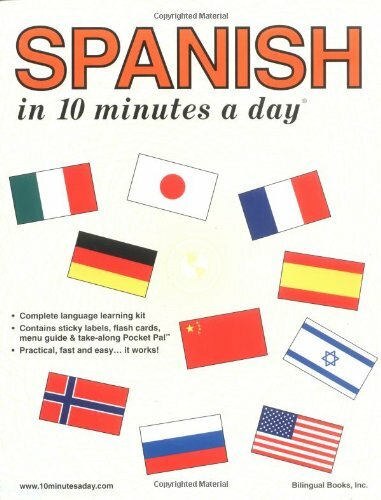 I have been browsing all around Amazon.com for a spanish language course to brush up on my skills. After reviewing the several courses available, I stumbled upon the Michel Thomas language course. I was most impressed with the reviews and decided to buy the 8 CD set. It's true that once you listen to the lessons you're able to retain most of the information learned. I love the idea that Mr. Thomas stresses relaxation and non-memorization. It definitely takes away a lot of the pressures and anxieties off the student to make the learning experience more pleasurable and rewarding. I was not annoyed at all by the male student as in some of the previous reviews. He was very helpful to me because I could relate to some of his mistakes. I give Mr. Michel an A++ because I really enjoy studying with him and I can't wait to buy the french 8 Cd set. I took French in school, and I'm not really sure why since I live in Texas. So I finally decided to learn Spanish, which is spoken by many here. This course is a great start, but it is just a start. I plan to continue with other courses recommended by other reviewers. I spend a lot of time driving, so I intended to listen to the CDs on the road. I did that, but I also listened at home using the method recommended by Michel Thomas. I cannot overemphasize la importancia of pausing the CDs and formulating your own answers before listening to the students' answers. This is crucial to learning. I also typed out the words, phrases and sentences because visualizing the material helps me retain it. My biggest criticism of the course is (you guessed it!!) the male student. He is a complete idiot. His pronunciation of Spanish words es muy terrible throughout the entire course. It is downright painful listening to this dimwit stumble through the course. He is a distraction to the learning process, and Michel Thomas should have realized this and replaced him with another student. Mr. Thomas, re-record this excellent course with a different male student and I will give you five stars instead of four. Several years ago I started a new job and found that many of my clients spoke only Spanish. In reponse to the need to communicate more effectively at work, I began to learn Spanish. I took a couple evening classes in conversational Spanish at a local community college. I also went through several CD progams, including Berlitz, Pimsleur, and a few others. While I got decent at reading and writing Spanish, listening and speaking always seemed more difficult. This probably has to do with my not wanting to make a fool of myself in conversation by saying something stupid to one of my clients. 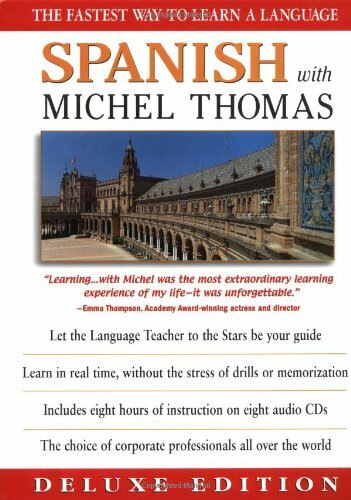 Recently I purchased this set of CDs by Michel Thomas and finally I have found a teacher who knows how to teach conversational Spanish. His method is excellent and fairly painless. Although I already knew the vocabulary and grammar on these CDs, they gave me confidence and helped me understand the nitty gritty nuts and bolts of the spoken language in a way that no other teacher or course had done. I would highly recommended these CDs as a place to start if your goal is to speak and be understood. The 4 stars reflect the poor packaging. The individual CDs are wedged into a plastic case and are not in their own sleeves. My set became dislodged in shipping and I received a set of scratched CDs because they were loose in the box and rubbed against each other in transit. You might want to buy them at a local store so that you can immediately return them if they are damaged. Otherwise, you need to ship them back and hope that the new set is not similarly damaged in shipping. I loved what Mr. Thomas said in the beginning: "Don't try to memorize, learn by rote, or mindlessly repeat over and over." That's one of the best lines I've ever heard regarding a language course! His approach is very memorable as he has a student who is very good and another that is pretty bad. This is a refreshing break from having one or two people saying something in Spanish then translating it with a small description of how it was used. In conclusion, this course is pretty refreshing, especially if you're looking for a new way to try and learn a language. It may not be quite as comprehensive as taking a formal Spanish class, but it can be a great supplement to formal study or foreign travel. 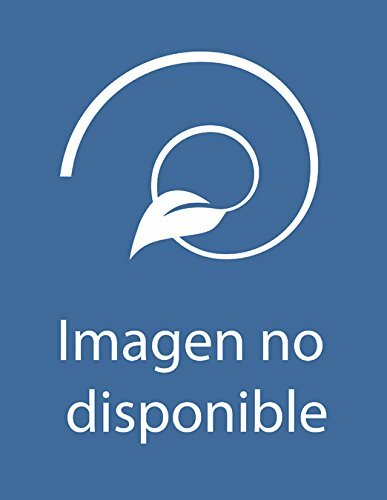 I purchased the introductory 2 CD set of this program after trying several others (Pimsleur, Learn Spanish in your car, etc etc...) I had been so disappointed in previous programs, but I decided to try this one. WOW! I finished the first 2 CDs, gave them to a friend, and went out and bought the full 8 CD program. One might be hesitant to learn Spanish from a native German-speaker with an obvious German accent. DON'T BE! His teaching methods are amazingly easy to follow. I had a basic understanding of Spanish verb conjugation and vocabulary from high school Spanish. My husband had NO background in Spanish at all. We listened together in the car, and after the first CD were constructing basic sentences, and understanding basic conversation on the Spanish radio station! Other reviews have valid points about the male student. It is quite obvious he is trying to sound stupid. Nobody could be THAT slow! The female is fine. It took me a bit of time to get used to Michel Thomas' salivary speech. It actually sounds like he is eating his lunch on the second CD. But this program is SO GOOD, that even I, who have an aversion to loud chewing sounds, could overlook it. I found this book quite easy to understand and well organized compared to previous spanish textbooks I've worked with.It's loaded with tons of practical examples and activities, and unlike many other texts has a heavy concentration in internet and high tech terms. As a beginnng Spanish student, I find the book cluttered and overwhelming. Also, a more organized approach to the subject would help.My foreign language background is French, so I am familiar with how to study a different language. This is by far the best beginning text that I have found in twenty-four years of teaching. The high-interest level of the text with the easy-to-understand explanations and interactive activities make this book very accessible to even the student with no prior background in Spanish. At the same time, the wealth of activities including proverbs, cartoons, business Spanish, dialogues, open-ended conversations, problem solving, cultural information along with the CD's, videos, and internet activities, also challenge and interest the student who may already have some knowledge of Spanish. The text uses a communicative and personalized approach that allows the student to develop skills in speaking, reading, writing, and listening comprehension. The writing assignments and classroom drills are not dry and boring as in some texts but very creative and often humorous which helps make teaching with this text a joy. Each edition of the text has incorporated new material to meet the needs of our students. I especially like the segments in this edition on computer technology, letter writing, medical Spanish, and environmental and social discussions. After completing this text, most of my students are inspired and encouraged to continue their study of Spanish. Many of my Spanish majors enjoy this text so much that they keep it for reference instead of selling it back to the bookstore. 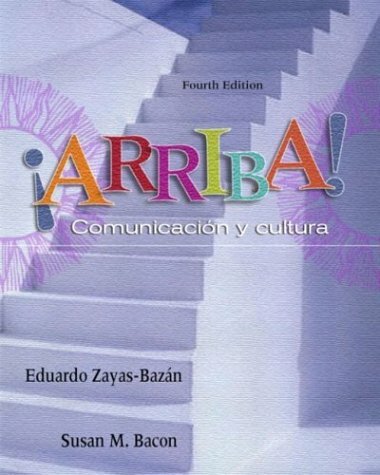 I have built several successful Spanish programs using this text and have many fluent students who adored the text. The bottom line is that this text has personality as well as being highly useful. I love it! After 6 editions, give it up. I watched this book grow from drill and kill in earlier editions to its present, bloated 6th edition. I have taught out of the 5th and 6th editions of this book for 4 years. The students absolutely hate it. It is cluttered and confusing. The order in which grammar and vocabulary are presented defy logic and all current research in second language acquisition. This book has been torn down and put back together so many times, that it is a hellish mess. Language methodology has changed and evolved over the nearly 25 years this book has been in use, and now this book doesn't know what it is or wants to be. The exercises in the book are worthless. All the instructions are in Spanish from chapter 1 on, and the students cannot interpret them, which renders the activities useless. Dicho has had a good, long run. It's time to shelve it and move on. The only reason I still use it is because I have no choice in textbook selection where I teach. 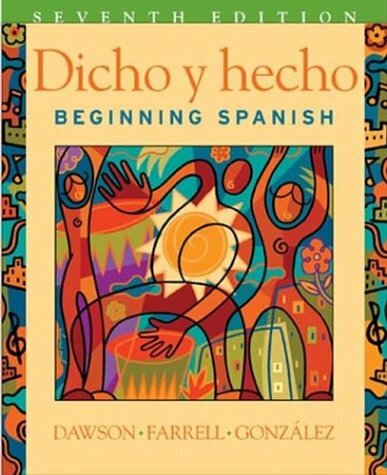 Dicho y Hecho is clearly one of, if not the best, Spanish Text books onthe market. It is skillfully structured to capture the attention frombeginner level and gradually progresses in difficulty from chapter tochapter to the advanced stage. The book is easy to follow, with illustrations that are timely, pertinent and colourful, masterfully usingvisual recognition to further cement the new vocabulary at the center ofsuccessive chapters. This is a must buy for any one wishing to learnSpanish and its grammar and is also a good place for persons with anadvanced aptitude but little practice to rebuild their skills. Theaccompanying workbook and cassette further augment listening andcomprehension skills. I used this series to start my German learning experience. Although one reviewer seemed to think cute pictures mean this book is for childern or is educationally bad, it actually works. I used this book for 10-20 minutes a day and I immediately could talk German! I went on with other courses, and the last time I was in Germany, I spoke in German and was understood! An excellent series for a jumpstart that primes your mind for further, more "intellectual" learning. I am starting the Spanish now with the hope for the same results. Sometimes simple and cute is more powerful than dull and dry. Este libro esta muy bien! I've never tried to learn Spanish, however, living in Southern California, it is now a necessity. Therefore, I wanted a book to give me the basics so that I could have an immediate ability to speak Spanish. This book has given me a very good basic foundation. The only way to make this book better would be to include CDs with pronunciation so that you knew you were pronouncing them correctly (although it does have the phenetics for the words). For me, this is a good way to "get my feet wet" and begin the learning process. I do 5 chapters a week, then use the weekend to review, and I also make practice tests to test myself. This works really well for me and really enables me to drill the information. As several reviewers have pointed out, this book is not exactly equivalent to a university textbook in Spanish. It is indeed quite simple, and filled with lots of pictures. Some people have difficulty getting motivated with the more advanced texts, and this book can convince the beginner that learning a foreign language really won't be as painful as a root canal. If you already know some Spanish, then your money would best be spent elsewhere. However, this book will be helpful if you have found yourself intimidated by past Spanish courses, or by foreign language study in general. I have passed this book up numerous times at the bookstore because of its obvious oversimplicity. Imagine my surprise when I enrolled in an "advanced" Spanish class given by a local organization, and I was given this book! I've been studying Spanish on my own for about a year, so I'm hardly an expert. But I found that this book is meandering, condescending and may even be crippling to the readers. Why? Because in its effort to avoid traditional teaching patterns, it does not give a language learner the vocabulary they need to further their studies. I'm not even referring to Spanish vocabulary -- I mean English! Never once does it mention "conjugation" or "tenses" or "subjunctive" (even though it uses the subjunctive at times, which could confuse the learner). What's wrong with that is it denies the learner the opportunity to use outside materials to augment their learning. There are myriads of books and websites about verb conjugations, but how can someone look them up if all they know is "the plug-in method" or "word patterns?" The book requires the reader to write everything three times. Three is not a "magic number." Some words can be learned immediately. Some words have to be repeated 20-30 times to sink in. The book begins by teaching you to ask questions, and I can practically guarantee that even those who finish the book will not be prepared to parse the answers if given by a real Spanish speaker. The artwork is childish and universally bad. The writing style is condescending. The concept that someone can learn a language in 10 minutes a day is so fallacious it is ludicrous. My pet peeve is in the English text, peppered with Spanish words. In most cases this is fine, but it gives the false impression that one can get by merely substituting Spanish words for English. Also, I've studied enough Spanish to think of the pronoun "Usted" in the third person (because that's how it's conjugated), yet they use it to replace "you" in most circumstances. It grates on me like fingernails on a chalkboard to read things like "When usted go," "if usted do" and "Usted have learned..."
The only thing which has prevented me from giving this book a one-star rating is the inclusion of those cute little labels which can be very useful for building vocabulary. The flashcards are a good idea, but there are far too few of them. Niece and Her Mom Loves It! I bought this for my ten year old niece who takes Spanish in her fifth grade class. She loves it, and I know this will make all the difference in her ability to access the language and learn. Her mom said the book is really great, and I wouldn't be surprised if my three-year old nephew makes some use of it too. I am buying 3 more copies of this book for fellow teachers in my building. I find the book easy to use, up-to-date, and a handy reference on any spanish word. The picture are real life situations from computer usage, to apartment rentals, to a visit to the beauty shop..all in pictures and the Spanish work for everying associated with the picture. An invaluable guide for the classroom or any one who want the Spanish word for an every day item or life experience. I'm trying to get the district to order them for all the teachers in my school as well as all schools in the district. I teach an adult ESL class and have discovered that this book is a resource I really cannot do without! In combination with the teacher's manual, it has become a valuable resource for teaching new vocabulary to my students. When I first started using it in my lessons, the students skimmed through it and were very impressed with the variety of pictures arranged by themes. After using it at home, they have ALL told me that it is a wonderful book and are so thankful they have it! The Vox Compact Spanish and English Dictionary contains more than 85,000 headwords, phrases, and examples, including the latest additions to the language plus technical, scientific, and business terms. This bestselling reference includes a 45-page section of Spanish idioms and expressions. I've had this dictionary for about eight years.I would have to say that if you are in the basic levels of learning spanish or maybe reading a simple novel in spanish, this would be your best bet.It is easy to use and easy to read although a little bulky.The only complaint that I have about it is that as I began reading more difficult novels and encountering words that are less common, this dictionary did not come into as great a use as it has in years past.But, like I said if you are doing beginning or intermediate levels of spanish, this would probably be your best bet. An excellent dictionary when you want a one-word definition, and still, words with multiple meanings are clearly laid out.Easy to read. Tending toward short entries.A joy for simple translation and a relief for vocabulary-building. There are adequate sections on pronunciation, grammar, and conjugation.There are lists of common irregular verbs in Spanish and in English. Encountering a foreign word for the first time, it is by definition unfamiliar.I was too often frustrated by otherwise-wonderful dictionaries which were simply hard to read (and my near-sight is excellent).This is by far my favorite of all the Spanish-English dictionaries I've seen. Advanced students will want a more advanced dictionary (and possibly a magnifying glass, probably not needed here).For the other 99.9% of (us) Spanish learners, this is a great find. A dictionary is just one of those books that doesn't have much to speak of (no plot twists, no character development, etc. ), so I'm afraid this review will be rather short. That said, this is the BEST Spanish-English dictionary I've ever used.It contains over 85,000 entries, plus complete descriptions of both English and Spanish grammar, tables of all the irregular verbs, and a 45-page section that defines literally thousands of commonly used phrases and idioms in both languages.It also has synonyms for words that have multiple translations so that you know the difference, for example, between a person's hand ("mano") and the hand of a clock ("manecilla").Nevertheless, it comes in a convenient size with easy-to-read font so that it's perfect for use by students.If you're a school student who's studying Spanish, this is the only Spanish-English dictionary you'll ever buy. This is the paperback dictionary to travel with if you're a serious student. Not pocket-sized, but worth the weight. I've been in language schools in Spain and Mexico, and in both places the other students had dictionary envy. It's coverage is excellent, and it supplies synonyms for each definition, so you know you've got the right word at the right time. I'm relatively new at teaching English as a Second Language (ESL) to Spanish speaking adults. Over the past year I've learned that this book is the first one I reach for when having trouble communicating with my students. Better yet, it is the first book the students reach for when trying to understand or with communicate with me. This book addresses conversational English giving the student a way to communicate in an English speaking country. The words and pictures are pertinent to everyday living and very descriptive. I have researched other books, but have not found anything which comes close -- at any price! -- to this picture dictionary. If you only purchase one book of this type, this is the one to buy. If you are going to buy mulitple books on this subject, this should be the first one! If, like me, you came here looking for a child's spanish word book then look no further. This book is fantastic for adults as it has a lot more detail than other spanish word books.I have a couple of similar books but this one is definitely the best. Each item is clearly numbered and includes both the Spanish/English translation. Great pictures too ! mejor comprar para tu !!! 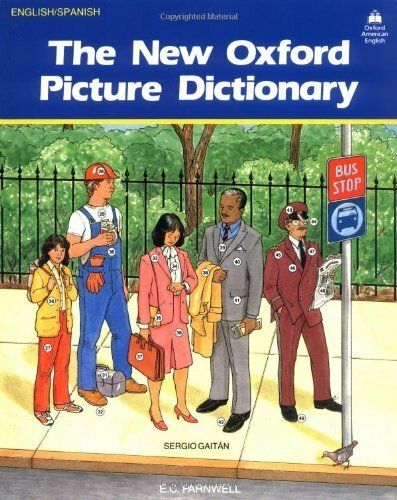 The BEST feature of the New Oxford Picture Dictionary is that the workbook and textbook pages are correlated. It is SO much easier to teach a class of non-English speaking clients and SO much easier for them to experience success. They LOVE the format and the information is pertinent, with necessary language skills taught first. The pictures are EXCELLENT, and the content superb. Because I teach for 8 hours a day before teaching an English as Second Lang. class, I have little time to prepare. This series offers a simple, direct approach that is easy to reference, and easy to work with independently for the novice English speaker. BEST picture dictionary/workbook on the market. Please publish one in Norwegian! I will buy it!!!!! It's impossible to overstate how useful this book is to students struggling to learn English. Although many entry-level learners have no patience with using a standard bilingual dictionary, they are reluctant to put this book down. The scenes from daily life (with the possible exception of outer space) are extremely helpful, particularly those dealing with work situations and vehicles. I have only two criticisms of this book: 1) Adding relevant verbs to the actions in each scene would be very useful (granted, this is asking a lot from a dictionary); 2) Phonetic transcriptions, particularly of the English words, would help enormously in pronunciation. For someone able to buy only one self-study book, I would say, "This is the one!" The book is very helpful in teaching beginning non-English speaking students. The teacher's guide is a useful tool with the Dictionary. This is a fantastic dictionary. 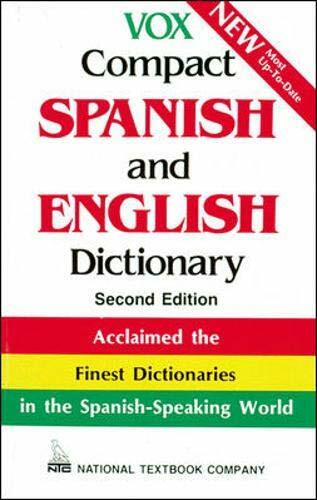 I spent quite a bit of time on amazon researching the best Spanish/English Dictionary. This one lives up to all of the positive reviews below. I have found this to be very helpful. One nice feature is that if you look up a conjugated verb, it actually appears in the dictionary with a cross reference back to the unconjugated verb. It also has several tenses of the words, so you can say the right thing even if you're wanting to speak in the past tense. I also like the sample sentences that it gives for many words...you can easily see how the word would actually be used. It's also conveniently small in width and height. But still packs a lot in! This is a very powerful mini dictionary at a very competitive price. It contains explanations, examples and phrases making it far more useful for travel than the smaller pocket dictionaries. It has also replaced my desk dictionary as it contains more recent words, is better organized and easier to use. If you're looking for a "one-size-fits-all" book this one is worth checking out. 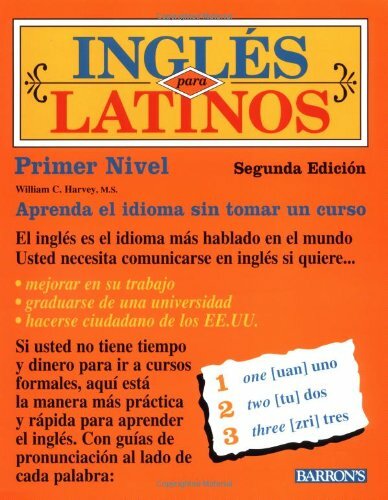 Hola amigo este libro es buenaso, y te asegure que tu si vaz a poder hablar English, solo tienes que tomar tu tiempo en escuchar los types and repetir las palabras. Con practicas todo se puede. Ingles para Latinos makes learning English enjoyable with little jokes and cute illustrations. You can listen to the tapes in the car for review. The tips on how to learn a second language are especially valuable. 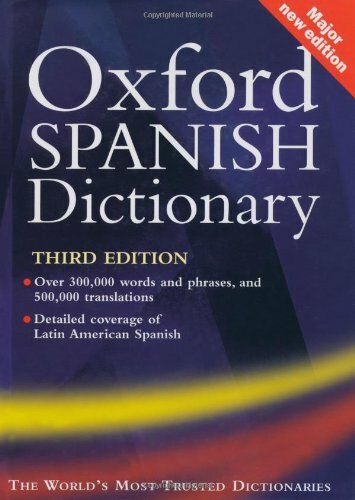 Oxford Spanish Dictionary on CD-ROM is very comprehensive in text and has features such as hypertext, double-clicking a word in any document... You can choose between Mexican or European pronunciation of Spanish. The quality of the sound is very high, and you can copy a large Spanish text to read. Then you appreciate that "Real Speak" program's results are much better than the artificial and robotic voice you can hear, for instance, in Microsoft's Encarta. It's a pity that there is not English audio pronunciation. I had problems with the installation program. After repeating about 10 times the same process, it worked properly. I need a dictionary, I am Peruavian student, that is in advantage level, I learn speak english and need this dectionary in orden to search some words unknow for me but I have a little problem I don't money, but I can pay some dollars but no much. What do you helping me? The best english-spanish dictionary so far. A perfect one for those who want to understand the true meaning of some spanish words that in Latin America have a different or sometines a double meaning. It is not a dictionary for travelers as it about 10Kg, but a great one for students. 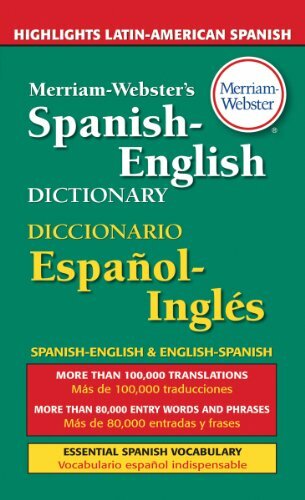 Simply the best English-Spanish Spanish-English general dictionary! It is current, easy to use, comprehensive, and has tons of useful extras! Highly recommended! PROS: well-written, with few typos. Each chapter introduces cognates to increase vocabulary. Comprehension questions before and after each essay or poem. Contains great pictures of important artwork, people, and landmarks. CONS: a little pricey. Audio CD and essays have slightly different wording at times. My Spanish conversation class used this text, and the essays on Latin society, ancient ruins, and past/present famous political leaders are very interesting and informative. It also contains important poems that focus on such topics as the adversities faced by the poor and minorities. I have an earlier edition of this book, but I assume not much has been changed in this edition. This book is a good, solid introduction to Spanish. 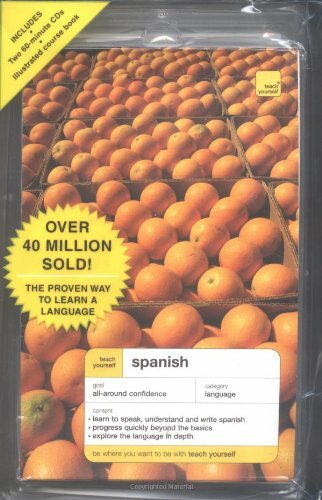 It's not a quick fix - there's lots of grammar, vocab., dialogues, etc., but if you're willing to spend some time reading, memorizing, and practicing, this book has most of what you need to know to begin speaking grammatically correct Spanish.